"The section is marked as being protected, but it does not have the correct format. It should contain only the <EncryptedData> child node." It turns out that a new key that was auto generated in this particular project dealing with WCF was injected between the <EncryptedData> nodes (as shown below). Once I removed the new key and attempted the decryption, everything worked properly! So if you come across this error, see if any new keys have been added (or any other elements for that matter) between the <EncryptedData> nodes because it will cause this error. Here is some good news: you can subscribe to get a digital edition of the MSDN Magazine for FREE! The MSDN Magazine (normally a $35 annual rate for paper copy) covers software development topics related to Microsoft technologies. Just click the link below and login with your Windows Live ID to sign up. It used to come with Dr. Dobbs Journal as well, but I read it ceased subscription in early 2010. "Product: MyWCFService -- Error 1001. Error 1001. Exception occurred while initializing the installation: System.BadImageFormatException: Could not load file or assembly 'file:///C:\Program Files\MyApps\WCFServices\MyWCFService.WinServiceHost.exe' or one of its dependencies. This assembly is built by a runtime newer than the currently loaded runtime and cannot be loaded.."
"The target version of the .NET Framework in the project does not match the .NET Framework launch condition version '3.5.30729 '. 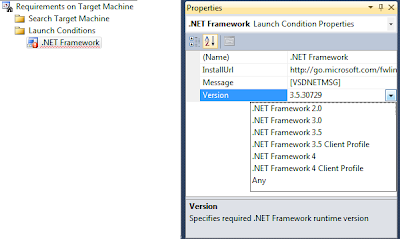 Update the version of the .NET Framework launch condition to match the target version of the.NET Framework in the Advanced Compile Options Dialog Box (VB) or the Application Page (C#, F#)." Well this was interesting to me because this was being displayed on a machine that has everything: .NET Framework 4.0, tools, you name it. There should be nothing missing. That's the 1st place to start obviously - make sure the .NET Framework is installed on the target machine. However this was not the case in my scenario. It turns out even though all of my project comprising the setup package targeted the .NET Framework 4.0, and even the Setup package prerequisites indicated the .NET Framework 4.0, there was still 1 piece of the puzzle missing. The problem: under the "Detected Dependencies" list for the setup project the 1st item listed was "Microsoft .NET Framework". Refreshing the dependencies does nothing for this value; it must be reconfigured manually. 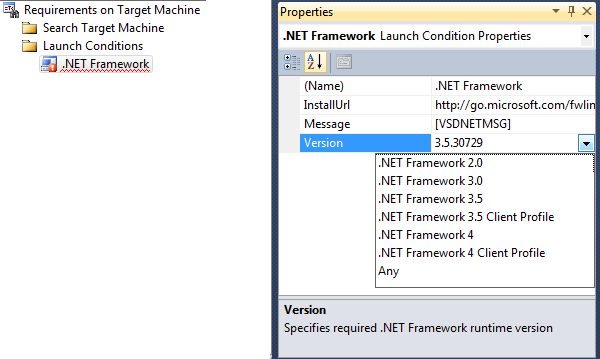 Double click the "Microsoft .NET Framework" item to bring up the "Launch Conditions" window and properties. In the 'Properties' window, change the 'Version' attribute to .NET Framework 4.0 (or whichever framework for your scenario). The Launch Conditions window is displayed below. After making the change, the installer package worked perfectly and installed without issues. Recently I have been working with the SyndicationFeed class in the System.ServiceModel.Syndication namespace. It allows us as developers to work nicely with Atom 1.0 and RSS 2.0 content. A problem arose when I needed to return this object from RSS to a consuming Silverlight client. The problem was that the raw SyndicationFeed class is not serializable, so I needed a solution to serialize the Feed and return it. This was one time I was happy to find that no custom serialization methods, or mimicking all property values in my own DataContract to return was going to have to be the solution. Instead there are 2 nice classes in the same namespace that do exactly this for us: the Atom10FeedFormatter & Rss20FeedFormatter classes. In my case I was working with Atom 1.0 content so I was able to use that Serialization class. The solution was simple. Alter my WCF service to return a type of 'Atom10FeedFormatter' defined both on the OperationContract and implementing service method. Then the client can define the return type to receive, and place it right back into a SyndicationFeed object if desired. There are also Atom10FeedFormatter(Of TSyndicationFeed) & Rss20FeedFormatter(Of TSyndicationFeed) classes to serialize classes that derive from those types, and there are all the same classes for the 'SyndicationItem' object as well. Needless to say there is some flexibility in serializing this data to be returned. So let’s take a look at the code; 1st the code to extract a SyndicationFeed (i.e. from an RSS link off the web). Lastly, the client code to receive the Atom10FeedFormatter and place it back into a SyndicationFeed object. You may wish to do this before binding to controls. Recently I had trouble on a Windows 7 Ultimate Machine with Expression Encoder 4 installed with a "File type isn't supported" error being returned when programming against the SDK. Upon creating an instance of the MediaItem object, the exception was thrown. It turns out even with Win7 ultimate, EE4, and Windows Media Player 11 installed I was still missing some codecs. I downloaded a robust codec pack from the link below and it solved the issues. Microsoft also offers a codec package for older versions of Windows Media Player, but to make sure I had no more issues I installed the larger free package offered from CNet. Once the additional codecs were installed, the code continued to work perfectly. Remember as well, if this code is in a service or .dll, make sure those codecs are in place on machine or server where deployed as well, to prevent the "Well it works on my machine, but not the server..." kind of issue. If you create a new Silverlight control using either VS.NET 2010 or Expression Blend 4, you are already off on the right foot for setting up a test ASP.NET application for running and debugging a Silverlight control. The newer versions of these applications configure well the test project, creating the 'ClientBin' folder, and associated test .aspx page including preconfigured <object> tags referencing the control. But what if you have an old or mis-configured project that manually references a .xap file, or had to be constantly updated in Explorer in the referenced path? It is especially important to have the configuration correct in a test app or debugging the .xap from the source Silverlight project is not possible. The following steps describe how to easily reconfigure your ASP.NET test harness to properly reference the .xap generated from the Silverlight control created within the same solution. 1. Right click the ASP.NET test project and select 'New Folder'. Name it 'ClientBin' (without the quotes). Only do this step if the folder does not already exist. 2. Right click the ASP.NET test project (this project should be in the same solution as the Silverlight Control being referenced) and select 'Properties' (or 'Property Pages' for website projects). 3. While still in the Properties, open the 'Web' (for web project types) or 'Start Options' (for website types) and make sure to scroll down and have the 'Silverlight' checkbox checked under 'Debuggers'. 4. Select the 'Silverlight Applications' tab or selection on the left hand pane. 5. Click the 'Add' button to bring up the 'Add Silverlight Application' dialog box. 6. Make sure the radio button selection for 'Use an existing Silverlight project in the solution' is selected, and select the Silverlight control to reference. 7. In the 'Destination folder:' field, make sure 'ClientBin' is in the textbox. This will most likely be pre-populated. 8. Configure the remaining options to your liking. I suggest leaving 'Add a test page that references the control' checked as this will save you from having to do this from scratch. At this point try starting debugging the Silverlight code by placing a breakpoint in the source. Obviously make sure the ASP.NET test app is set as the default project, and set the newly created page to be the startup page. If you configured it correctly, your code will properly place any new builds of the .xap into the ClientBin folder of the test app, and should allow for proper debugging. There must be 1000 good blog posts about setting up the clientaccesspolicy.xml and crossdomain.xml files for a WCF service being accessed by a Silverlight application or control. This consists of dropping these files in the root of the site on the server where the site is hosted. But where do these guys go if you are actively running your WCF service locally (through VS.NET) and still want to consume the service? "An error occurred while trying to make a request to URI 'http://localhost:6000/MyWCFService.svc'. This could be due to attempting to access a service in a cross-domain way without a proper cross-domain policy in place, or a policy that is unsuitable for SOAP services. You may need to contact the owner of the service to publish a cross-domain policy file and to ensure it allows SOAP-related HTTP headers to be sent." What - I thought I fixed this a long time ago?? I realized I had never configured the clientaccesspolicy and crossdomain .xml files just for a service running locally. I started plopping those (2) files everywhere: wwwroot, project, etc. I finally found where they should be placed in order for an ASP.NET app containing a Silverlight control that has consumed a locally running WCF service is supposed to go: in the root of the project folder alongside the .svc and .vbproj files. Once I placed the (2) files into that directory containing the raw VS.NET files, the SL control began working properly. Makes 100% sense too. If running through VS.NET Cassini local server, those files should be located with the actual service itself. Again, this is only 1 of many, many ways to solve the original issue at hand. This is only a solution for Silverlight controls that consume a locally running (not installed) WCF service. Hopefully this saves someone else a few minutes. If you recently did an upgrade of a project from VS.NET 2008 to 2010 that contained the Microsoft Charting controls for .NET, then you probably encountered some errors upon 1st run if you are now targeting the .NET Framework 4.0. The solution is to upgrade the charting references to the new .dll version throughout the application. "'Legend' is ambiguous in the namespace 'System.Web.UI.DataVisualization.Charting'." This all points to the need to update the references to the 4.0.0.0 version of the System.Web.DataVisualization.dll used by the MS Chart controls. The following steps need to be completed to get your project current and working with the 4.0 version of the Chart controls. 1. Remove the reference to the System.Web.DataVisualization .dll in the project. If just converted it will still be referencing the 3.5.0.0 version of the .dll. 2. Add a reference to the new 4.0.0.0 version of the .dll from the '.NET' tab when adding a reference to your project. You can view the 'Version' column to make sure you have the correct reference. 6. In the markup of any page using the Chart controls, remove the page registration for the assembly; just delete it. The next step will add back in the proper registration. 8. Rebuild your solution and run it. Your MS Chart controls should now be displayed properly! Samples Environment for .NET Framework 4 Chart Controls Released!